Nos. 29-31 Castle Gate (A Nicholson, 2004). Higher up Castle Gate we come to the Women's Hospital No. 29-31. This excellent institution was founded by the late Miss Catherine Wood and the house in which it carries out its good work is of very considerable interest. I do not know by whom it was built, but it is nearly contemporary with Lord Howe's house and its doorways are of great beauty. It was used as a barracks during the early part of the 19th century and there is a story that the high-spirited young officers of the cavalry regiment who were on duty in Nottingham and who were billeted in this house upon one occasion rode a horse up the staircase still remaining in the house on to the first floor. 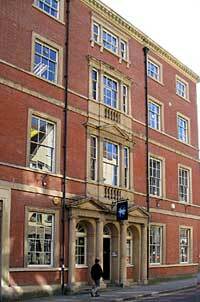 This building was the original home of the Nottingham County Club before its removal to its present premises in Bridlesmith Gate. One of the strangest things about St. Nicholas Church is its dedication. St. Nicholas, or Santa Claus as we call him now-a-days was bishop of Myra in Lycia and suffered persecution under Diocletian. He is the patron of youth, of merchants and of sailors and travellers. It is possible that, as St. Nicholas is the nearest church to the Leen, whose waters may be said to have been in some sort navigable as far as Maltmill Lane, there is some connection with sailors or bargemen. It must have been very slight and the dedication is the more remarkable on that account. St Nicholas' church was pulled down in the winter of 1642-43 to prevent Royalist musketeers firing on the castle; it was rebuilt in 1671-82 and the aisles added in the 18th century (A Nicholson, 2004). The church seems to have been founded soon after the Conquest and its appearance must have been very like St. Peter's Church for the only contemporary view of it, a small picture included in Speede's map published in 1610 shows it to have possessed a western tower and spire and possibly aisles. Of this Gothic building nothing remains although a few fragments of its foundations were discovered in a spot, now unknown, in Rosemary Lane by the Sexton of the parish while digging about the year 1800. Its destruction is due to the Parliamentarian Wars. In 1643 the gallant Newarkers made an onslaught on to Nottingham and very nearly captured the Castle. Mrs. Hutchinson says that they were admitted into the town by the treachery of Alderman Toplady, but as no action was taken against him and as in the course of a few years he became Mayor of Nottingham, the statement is of very doubtful accuracy. At any rate their attack was so far successful that they seized upon St. Nicholas Church and used its tower as a battery from which to bombard the Castle, with such effect that the Castle garrison were hard put to to stand to their guns. Eventually the Newarkers retired and the Church once more passed into Parliamentarian hands. Colonel Hutchinson was not going to expose his garrison to such a danger a second time and so the old Church was completely pulled down and its materials carted away and used for other purposes. The congregation was accommodated in a loft built over the old chancel of St. Peter's Church and the site of St. Nicholas Church remained void and desolate for twenty-five years. In 1672, after King Charles II. had been for some years restored to the throne of his fathers, a start was made in the re-building of the Church and a plain brick edifice with stone dressings was put up. It was cruciform in plan and its nave lacked aisles, but it is interesting as a typical Church of the period. The brickwork showing strange and irregular coursing is curious. The tower is debased, but the tracery of the belfry openings show Gothic influence and I am always doubtful as to whether or no they are a survival from the old Church. In the Castle is preserved an architectural fragment which was found in Low Pavement and which is said to be a portion of the Churchyard Cross from St. Nicholas Church, though upon what authority I know not. The paucity of detail and enrichment of the fabric speaks volumes for the poverty of the times consequent upon the Civil War. 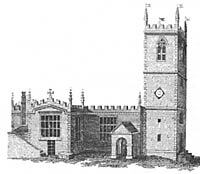 St Nicholas' church in the mid-18th century. The south aisle was added to the Church in 1756, and the north aisle, at a cost of £500, in 1783, whilst in 1714 a curious and hidden inscription was found on one of the rafters saying ''This Church was burnt and pulled down in 1647 and begun again in 1671." Although this was signed by the Rector and Sexton, the date 1647 is manifestly wrong. Early in the 18th century as so much room was required for the voluminous skirts of the ladies, a gallery was added at the west end of the north aisle and in 1811 a small organ was placed in the Church which was replaced in 1848 by one purchased from the Roman Catholic Chapel in George Street. This organ, modernised and rebuilt still remains, I believe, incorporated in the modern organ of the Church. Without being at all beautiful the present St. Nicholas Church presents a singularly interesting and instructive interior. Its black and white gabled roof, built in 1848 seems sadly out of keeping with the round headed windows so typical of the Georgian period. Surely a flat ceiling must have been the original design. The round columns carrying the roof have a strange appearance and one misses the arches which one would have expected to see borne by such columns. But there is no doubt as to the beauty ot the three-centred chancel arch and the elaborate moulding of the flat ceiling of the chancel is of fine workmanship. The fittings of the Church are curious and the seating retains some trace of the old family pews while the arrangements of these seats are singularly inconvenient for traffic in the Church. The chancel rails are excellent and display the twisted balustrade so typical of 18th century woodwork. The inlaid wooden pulpit is startling and may be assigned to the early days of the 18th century and the whole Church seems to very well live up to its nickname of "The Drawing Room Church." The Royal Arms over the north door and the Newdigate Achievement in the gallery are of considerable interest to students of heraldry while the somewhat dull series of monuments are of importance as telling the tale of the humdrum life of the town in the 18th century. In fact the only monuments of general interest are the series of gravestones to Lawrence Collin and his descendants in the north aisle. 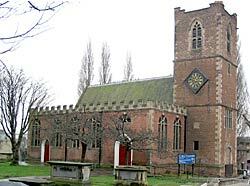 The Church has two bells, the larger of which was cast in 1726 by Hedderley for a cotton mill in Broad Marsh.